The entrance, just a short stroll from Clapham North tube station, barely merits a second glance. 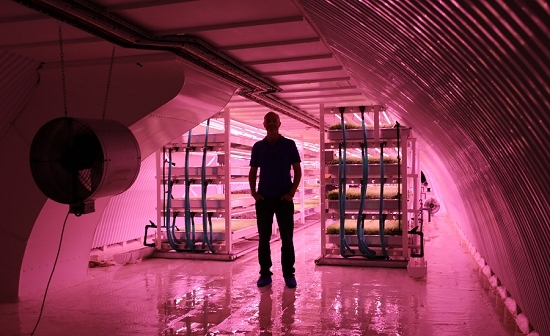 But deep underground, after 177 echoing steps, you find the most innovative new food growing business in London. Growing Underground is a subterranean start-up that, at the time of writing, is just about to begin full commercial production. Here at the Market, County Supplies will exclusively distribute their range of micro herbs including pea shoots, radish, mustard, coriander, red amaranth, celery, parsley and rocket. 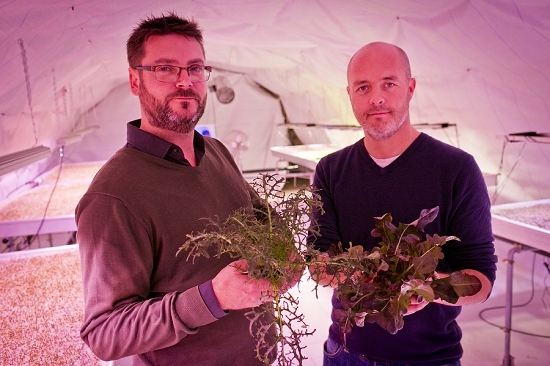 "We're delighted that our first shoots will be delivered to the surface in the next few weeks," explains Richard Ballard, pictured below left with co-founder Steven Dring. "We're coming very close now to receiving our first delivery," confirms Rob Hurren, managing director of distributor County Supplies at the Market. "It's got our customers on the edge of their seats." He adds: "Having a product of this high quality grown on our doorstep 365 days a year is what it's all about. 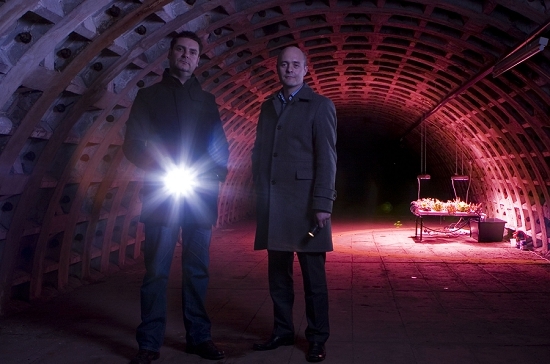 We're very proud that Growing Underground have chosen us as their distributor." The products themselves are, of course, not unique. Micro herbs are grown by many other competitors both in the UK and Europe. 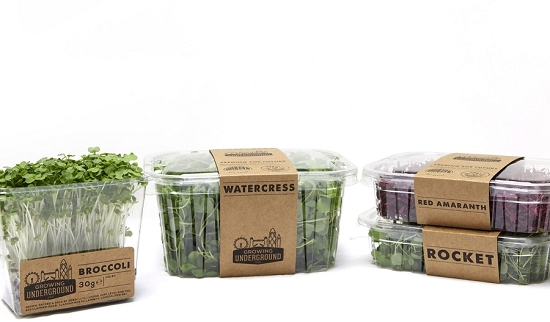 (See our Grower Profile on Koppert Cress in the Netherlands, for example). But no one can rival Growing Underground in terms of their location, which dramatically increases the speed they can bring product to market and reduces emissions used in transportation. "We're very close to New Covent Garden Market here," says Steven, guiding me around their site. "It's all about the freshness … local supply is important because of the flavour, not just because of the geography and the low food miles. "If the chefs are enjoying the flavour of the product they are going to keep going back to County Supplies." 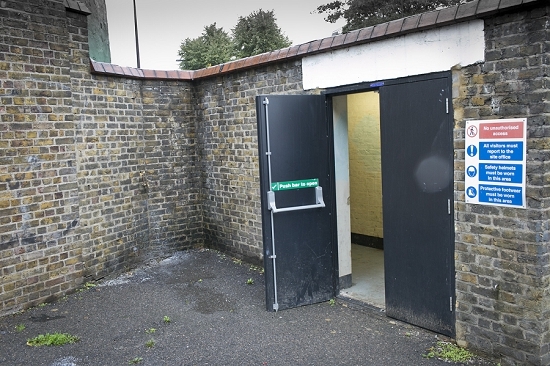 After dreaming up the original idea over a pint, the pair approached Lambeth Council and received the keys to the disused World War Two air raid tunnels in 2012. "They were very supportive … Lambeth is a really great borough for food production," says Steven. 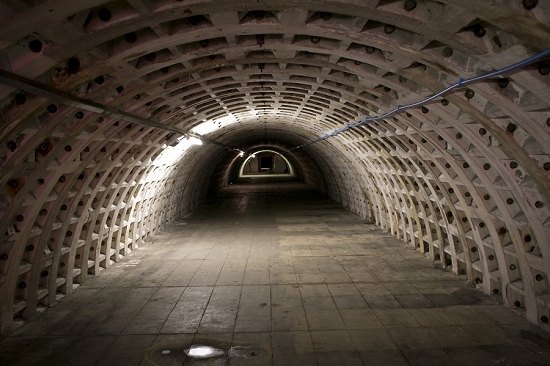 The site, 33 metres underground, was originally designed to accommodate 8,000 Londoners during wartime air raids. The temperatures below ground are naturally cool at 16°C. This factor, along with the dimensions of the tunnels, makes them ideal for the deployment of modern LED lighting to grow leafy crops. For 18 months, the pair tested the technology and researched the market. "We embedded ourselves in New Covent Garden for about six months," explains Steven. "We walked around every night and talked to the guys to understand what's being used, what products are there, what's selling, what's not, the price points." The pair has now perfected a system of LED lights, hydroponic drip irrigation and bespoke ventilation in a sealed clean-room environment. 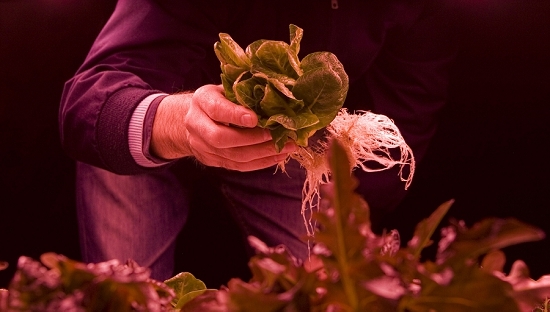 Growing Underground is designed to be a carbon-neutral business and sources its energy from green suppliers. The urban farm can supply product year round, free from the vagaries of the weather, seasons and pests. The founders believe that their pioneering concept helps to demonstrate a model for increasing food security and exploiting underused space in any urban environment. 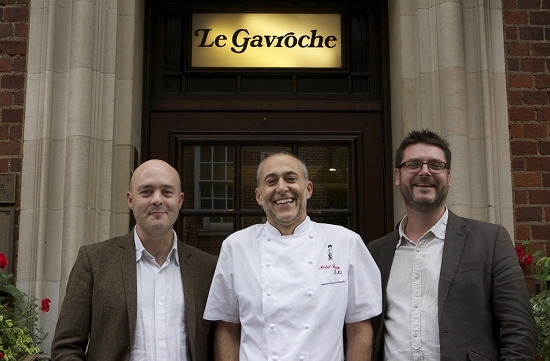 Chef Michel Roux Junior has now joined their team as a business partner. 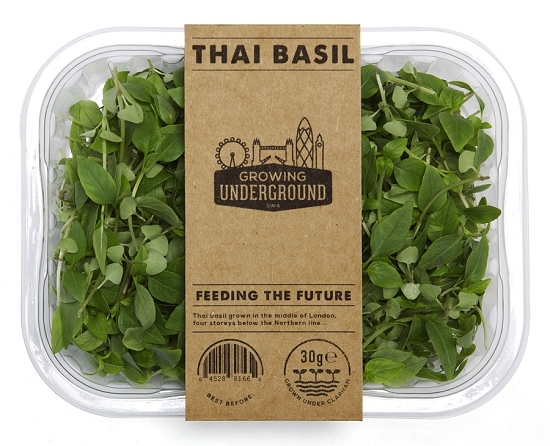 The chef said: "I'm looking forward to creating my first dish using produce from the world's first underground urban farm, less than two miles as the crow flies from the heart of London." 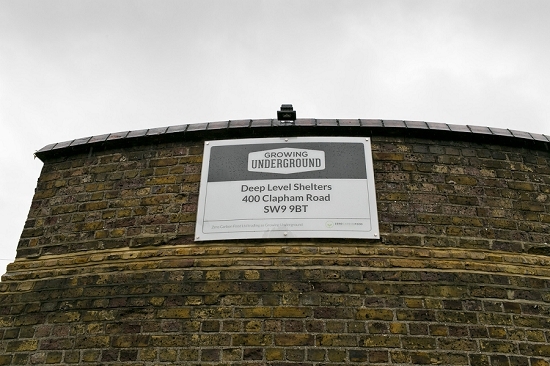 So what next for Growing Underground? There are plans to sell direct to the consumer and, if business goes well, to expand into adjacent tunnels and increase their range of crops. On a global scale, Richard is excited about the potential of this method of food production. "LED technology is in its infancy", he says, but while leafy greens and salad crops can be grown very economically, it will take some years to reliably cultivate crops such as maize and soya. "Give us five or ten years and rather than cut down the Amazon rainforest we will be able to have vertical farm stacks on the outskirts of cities that will be able to reduce that. "It will be much easier to automate in a closed environment, easier to ship out from a place. The structure of a city can be changed to produce and ship." 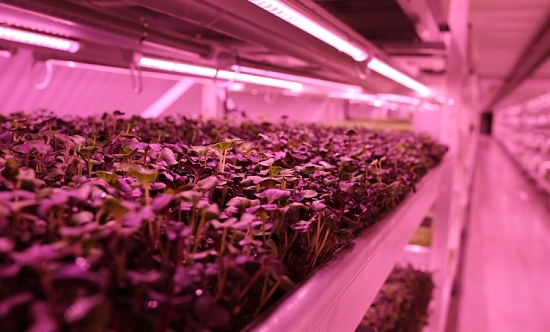 Watch this space – the future of food will be lit by these pale pink lights.